surprising with a non-named Legendary card :o is it a first? His name is untranslated. Hearthpwn always puts "Fluffy" in the title of untranslated cards. Apparently, he's actually called Mojomaster Zihi. Surrender to Madness Priest incoming? That is the first thing that popped into my head as well. Meta-defining, must-have legendary for me. This is the neutral combo-breaker I've wanted, but didn't know it. This will fit well in value-oriented control decks. I'm constructing Dragon Warrior on the first day with this. I want to obliterate a Mecha'Cthun Priest with this. Death to combo! It's a pretty niche tech card. With an aggro deck you can't play this because it's too expensive, and you'll run out of steam anyway. With a tempo deck you can probably play it. You can afford some high-cost cards but have a low enough curve to put on decent pressure while starved for mana. With a control deck you might be able to play it. While this does disrupt combo decks that typically beat classic control, it also might disrupt your own game plan if you rely on expensive cards to win the game, It's also pointless to delay your opponent if you can't finish them off anyway in the time you bought. Lastly, you really don't want to have this card in your hand against any aggressive deck. This might bump down combo decks a peg, but sadly it will probably not help classic control decks to come back into the meta. I can see the Rogue decks with this constantly keeping mana at 5 to thwart big mana decks. 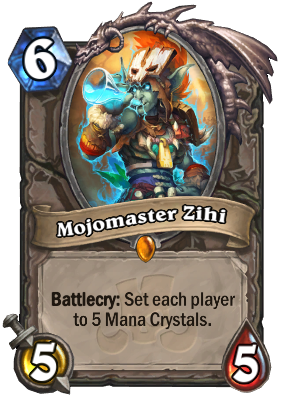 Mojomaster Zihi has been confirmed to be his name in English. "Fluffy" means it will get renamed to something else once it gets properly translated, right? No, it's definitely the Fluffy Potion Drinker. It's canon. Wondering if hearthstone can create a minion or spell that can silence opponent’s weapon and destroy it? Because it's a tech card! Tempo-Shudderwock. The new nightmare deck. Waiting to curve a little higher? No, not allowed. I'll re-cast my 1 mana SW and BC my other minions leaving you impotent to cast over 6...until you die. This is a fairly creative card IMO. While it does highly affect Druid due to ramp and setting them back(If you draw it), you can utilize it to slow down the game against other control decks as well. For example, playing against a Warlock that you know is probably ready to drop Gul'Dan and flood the board with demons and start healing back up, now they are set back 4-5 turns. Same against a Hunter with the new Zul'Jin card. I don't really see it creating an "Insta-Win" condition for you, however it at least will buy you potentially a turn or two to change the course of the game. Pretty much a dead card against any Aggro deck though.